Technologies, we developed once ago and found again in the deep space of our hard disk. 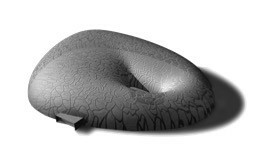 >> Not at least the membrane constructions of Frei Otto widespan lightweight structures [m1][m2] are well-known . Since then, the research for new, more efficient lightweight structures has continued. Research groups engage in constructions using membranes, cable nets or shells. However, the combination of building materials is not new nor is the combination of concrete and membranes. Nevertheless, to achieve the ideal utilization of concrete and membranes, it is necessary to adjust the construction to the special material properties. The patent “membrane concrete composite construction” (Fig.1) takes a step forward towards the further development of structure combinations. With this method not only the different materials complement one another, but also does the structural design of the complete construction. The construction results from the special manufacturing. 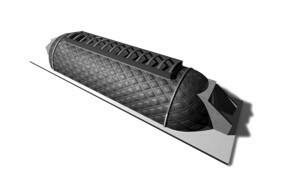 A two-part membrane shell is made which provides an integrated chamber system between both membranes. 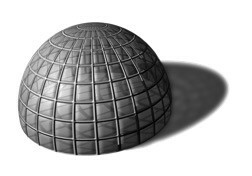 The shell is fixed to the floor and inflated by air pressure, similar to pneumatic buildings. When the form of the building is completed, the chamber system is inflated by overpressure. Finally the chamber system is filled with concrete UHPC (Ultra High Performance Concrete). 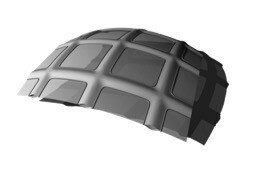 After the UHPC is consolidated, a grid shell is formed which primarily is stressed by compressive forces. Then the air pressure inside the building can be reduced which results in a lightweight structure made of “membrane concrete”. 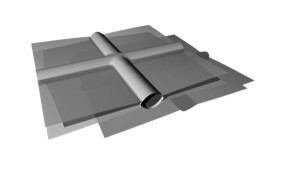 With this method, the membrane system could fulfill several functions which do not only serve for sheeting but under special circumstances also for structures. Preferably new materials, for example, UHPC (Ultra High Performance Concrete) [c1], should be used which allow a well optimized lightweight widespan construction.